Welcome to Our DIY House on this fine Fall day. Why don’t you come in and I’ll make you a vanilla latte? Or… wait! You simply must take a walk with us outside first. It’s just too gorgeous out here in the autumn. 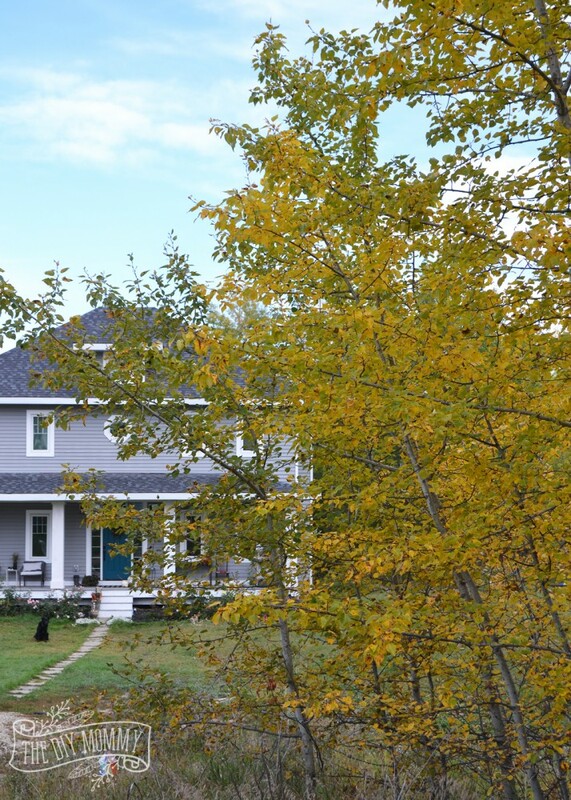 We fell in love with our country acreage exactly 9 years ago this week when all of the leaves were gold and red. We’ve just given our porch a little makeover this summer. It’s been so lovely to be able to sit out here during the late summer evenings, and we’re still enjoying the porch this Fall. You just have to cuddle up with a throw now when the evenings get chilly. 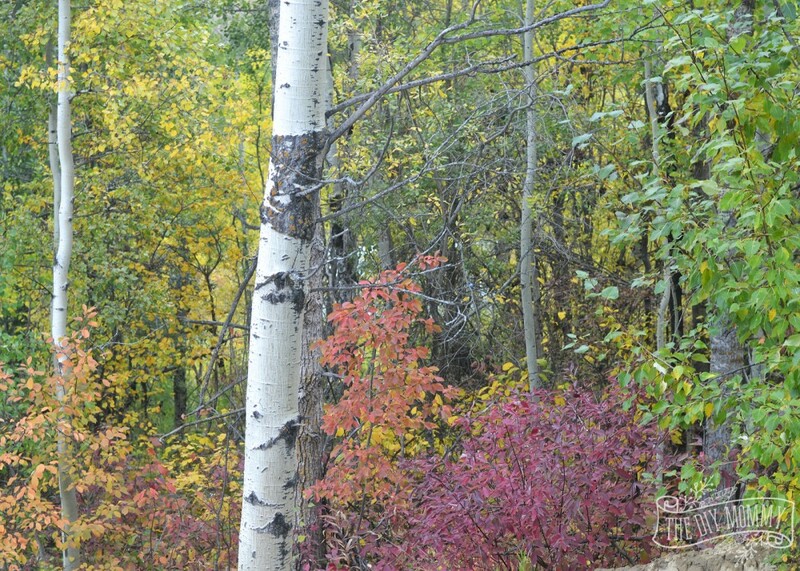 It’s so relaxing just sitting outside and taking in all of the Fall colours around here. That’s why I kept our interior Fall decor quite simple and woodland-inspired. Because… how can I compete with THIS? Well, come on in. I kept our front door decor simple too. I couldn’t bear to throw away our summer planters just yet. 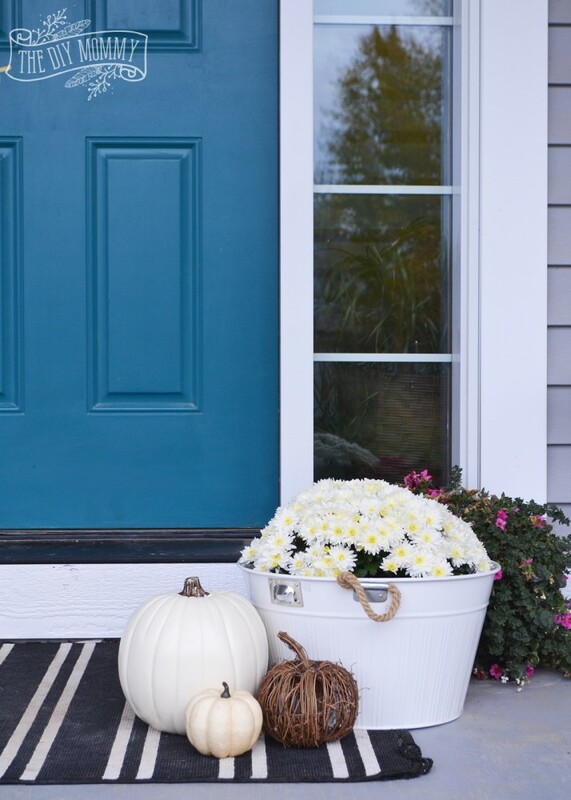 I think a couple of pumpkins and white mums do the trick! Once inside, you’ll find some nature-inspired decorations on our shoe cabinet. 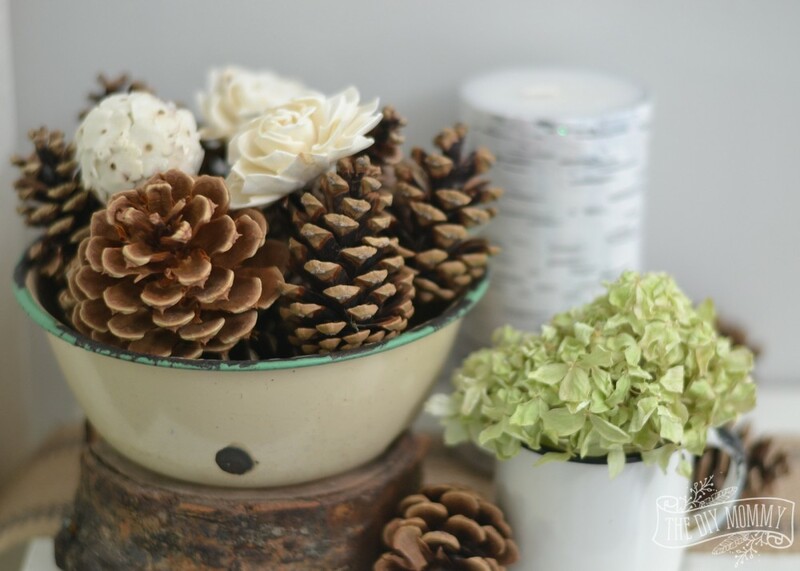 The pine cones are some that my parents picked up on their travels, and the dried hydrangeas are from our yard. Come into the living room! 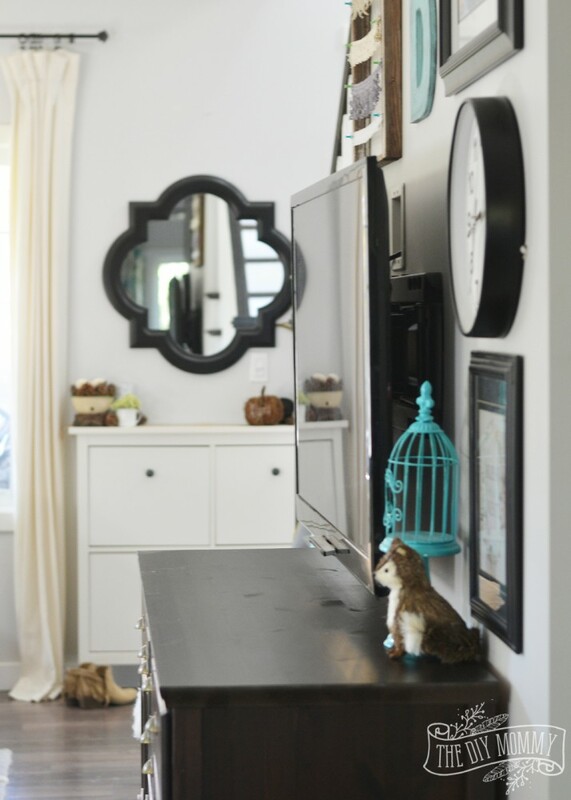 You’ll see that my handy, loving hubby mounted our TV to the wall this summer and it’s made such a difference. I love to keep our seasonal decor light and happy and kid friendly. It’s so fun to have decorations that my girls love too! 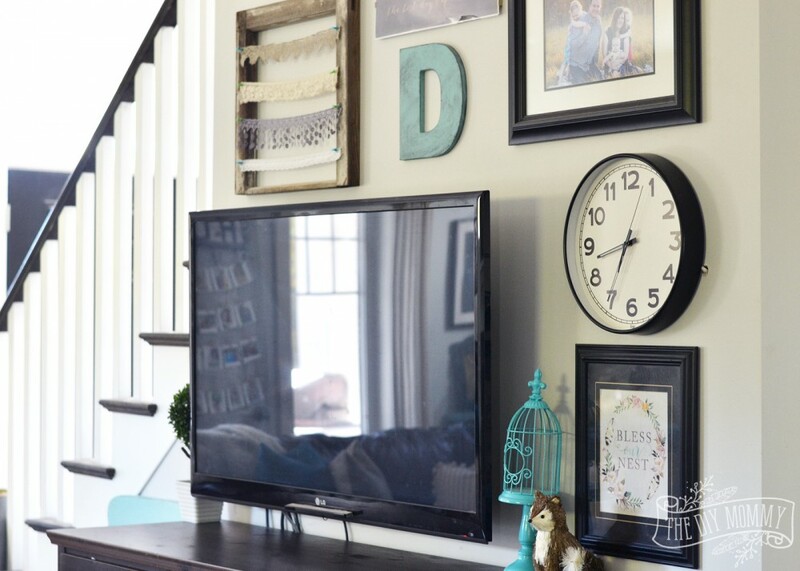 Our new mantel clock makes our living room feel so rustic and homey. I’ve loaded the couch with pillows as per usual. 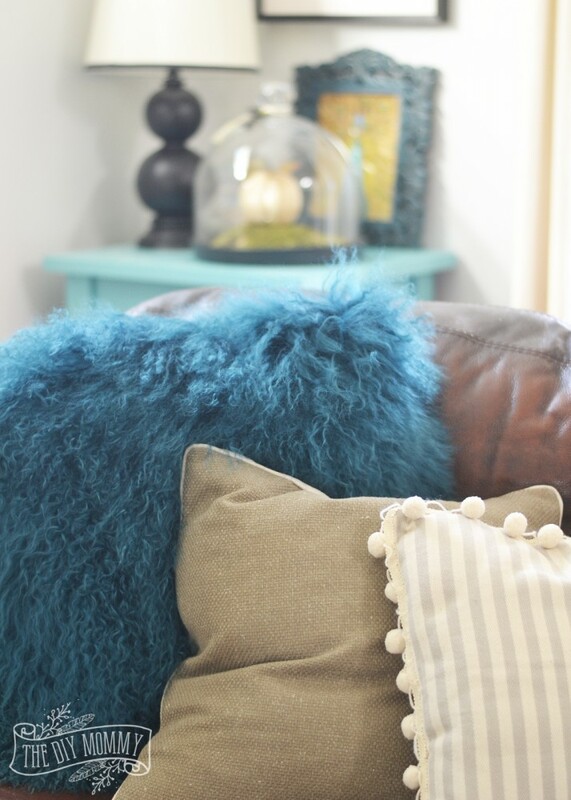 The furry one is from Urban Barn, the mossy green one is from Homesense and the pom-pom pillow is one I altered from Fabricland. Fall makes me want to pile on the fuzzy throws and pillows! Tucked in a corner is my turquoise Ikea cart with some fun things on top like this faux pumpkin under glass. 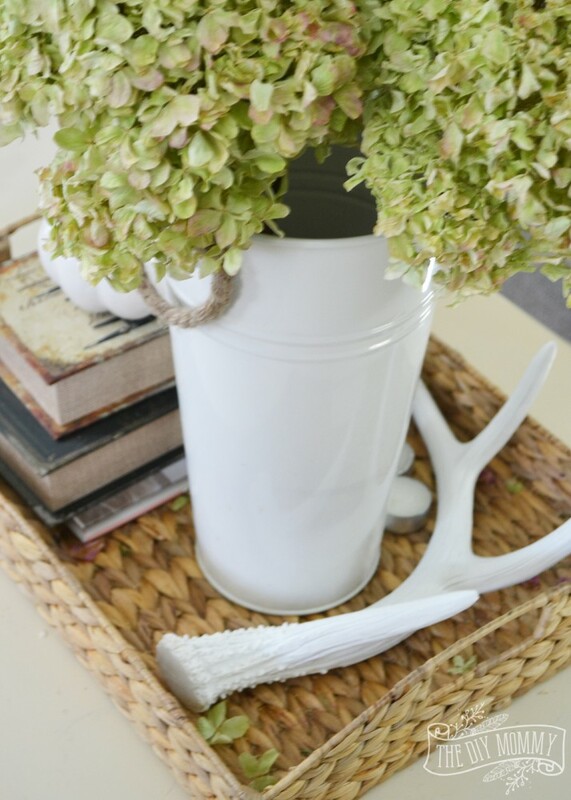 On the coffee table are more dried hydrangeas from the garden and a faux antler from Urban Barn. Moving through to the kitchen, not much changes in here for the seasons, but I’ve made it a little cozier with throws and a Fall table setting. 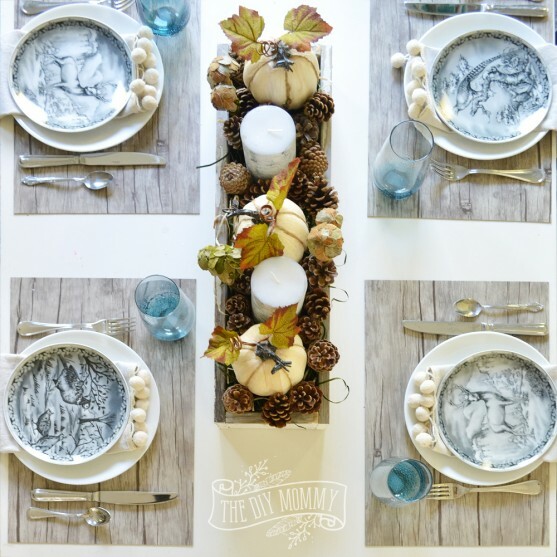 My daughters and I found these woodland plates at Urban Barn and we had to take them home! I made the napkins out of drop cloth I hemmed, and then I sewed on some pom-pom trim. The centerpiece is some faux pumpkins, pine cones and candles placed inside my barnwood box. 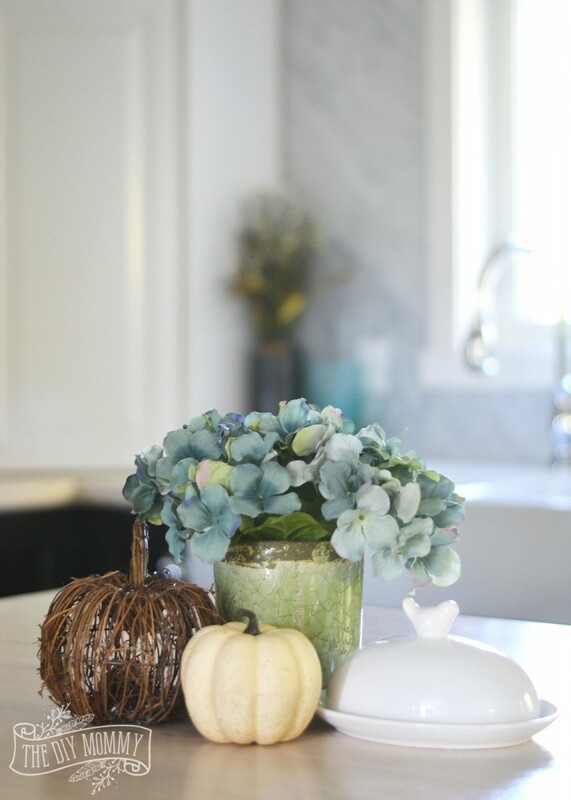 The rest of the kitchen has really simple Fall splashes through faux greenery and pumpkins. Now, if you walk around the corner you’ll discover my secret little coffee nook. 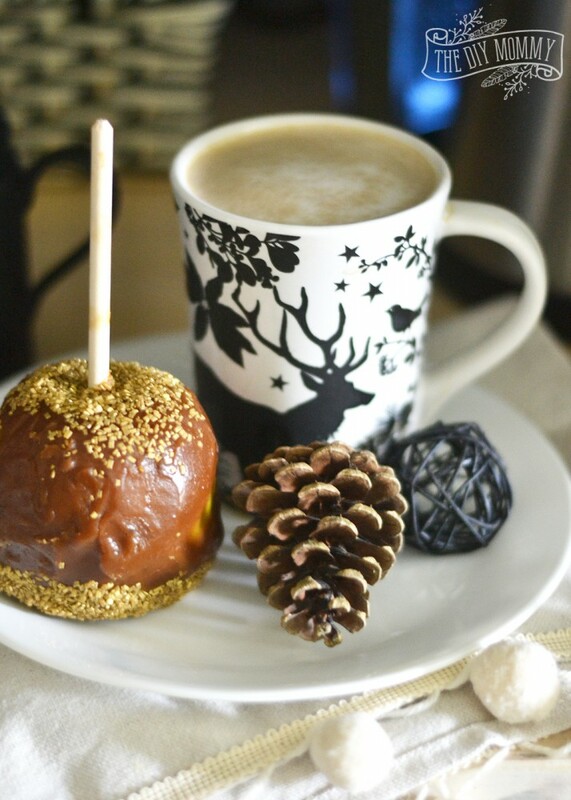 Here’s where I can make you a latte and we can share this delicious caramel apple my neighbor made for me! Finally, we can sit with our coffees and chat in the “adultiest” room of the house – the front sitting room. 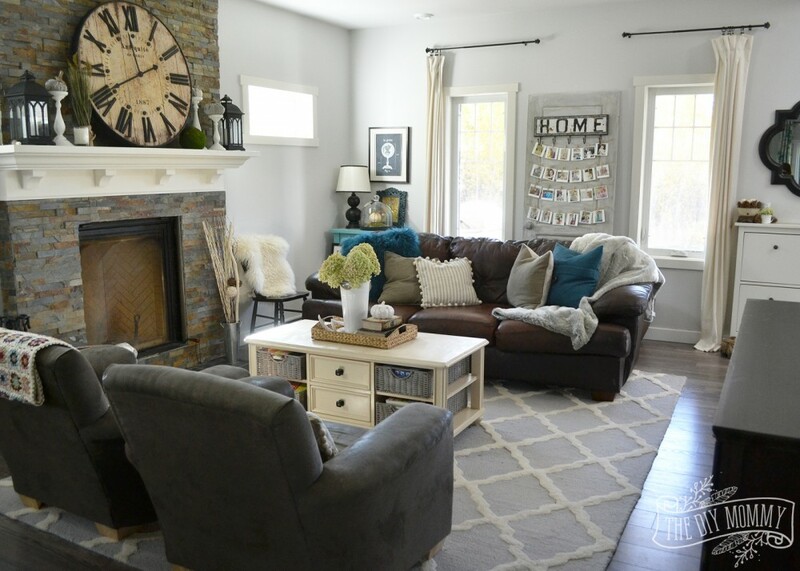 A cozy plaid throw and some pillows make this room feel cozy for autumn, and we collected twigs from the front yard for the coffee table. 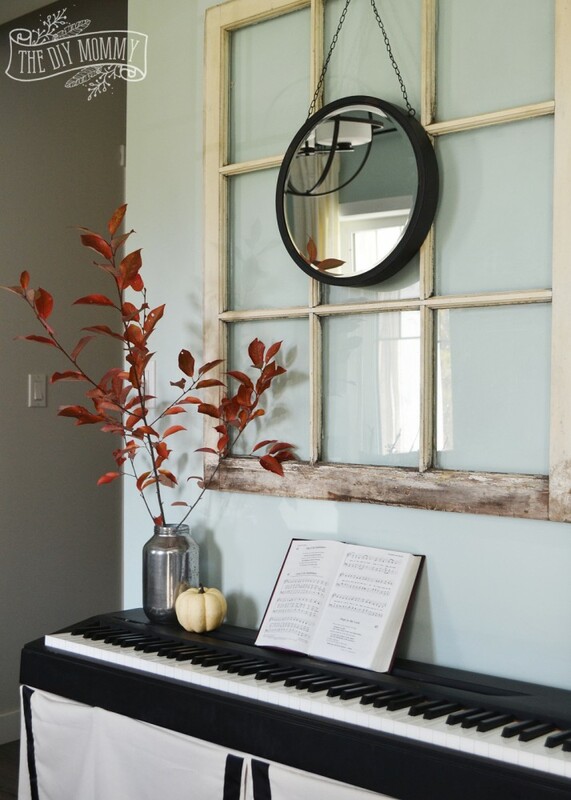 More clippings from the yard grace the keyboard, and I’m loving the look of this round mirror layered over this vintage window. Thanks so much for coming to visit us today on this gorgeous Fall day! 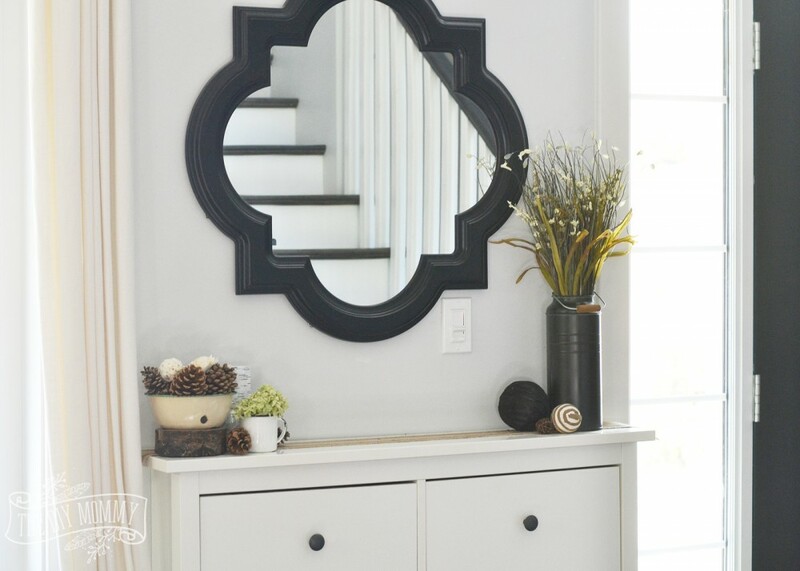 If you want to see more of our home, like the rooms upstairs, you can see our Summer home tour. 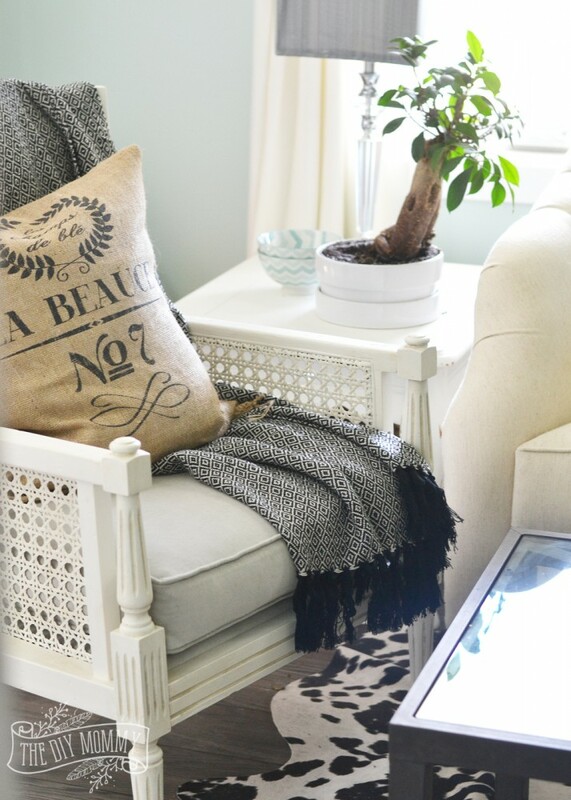 You have such a beautiful home and decor styling! Everything looks gorgeous! 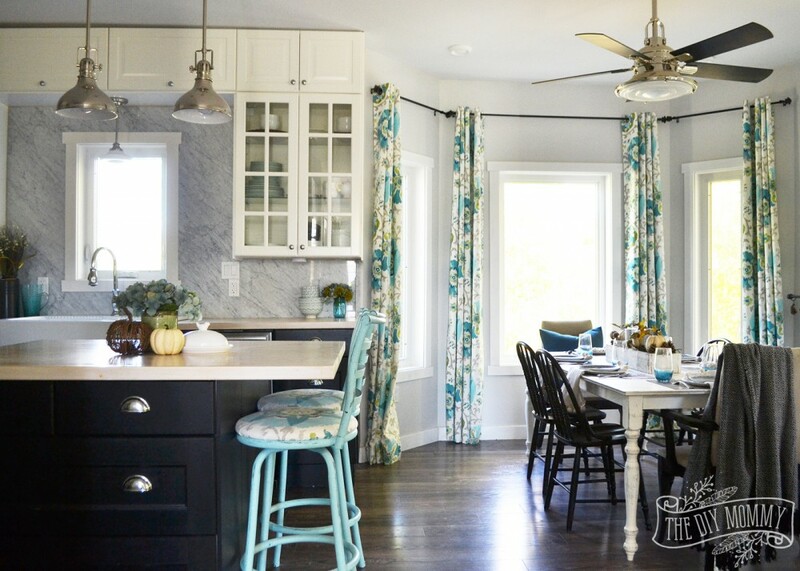 I love your dinning room curtains and your sitting room! 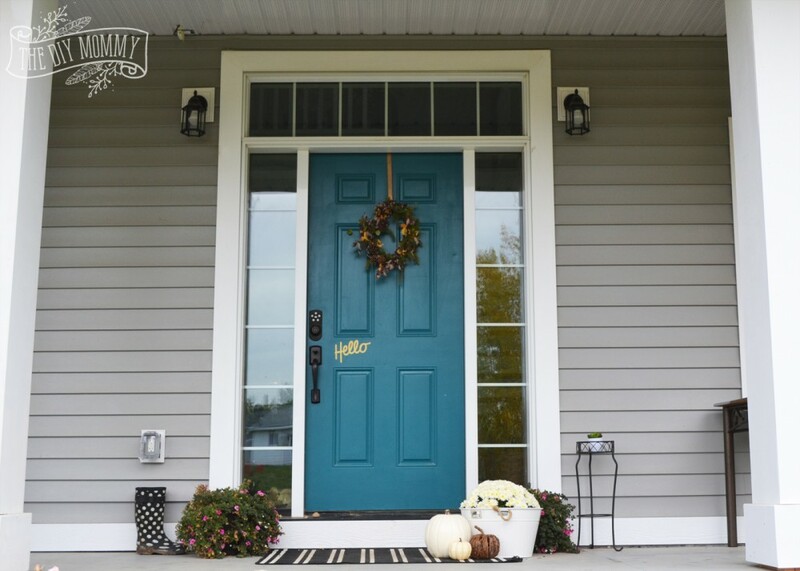 We still have to finish the columns on our front porch and I have Pinned yours because they are exactly how I want mine finished. Now I can show a picture of what I want instead of trying to explain it! Thanks. Wonderful! Thanks for stopping by, Marci! Beautiful as usual, love the table setting! 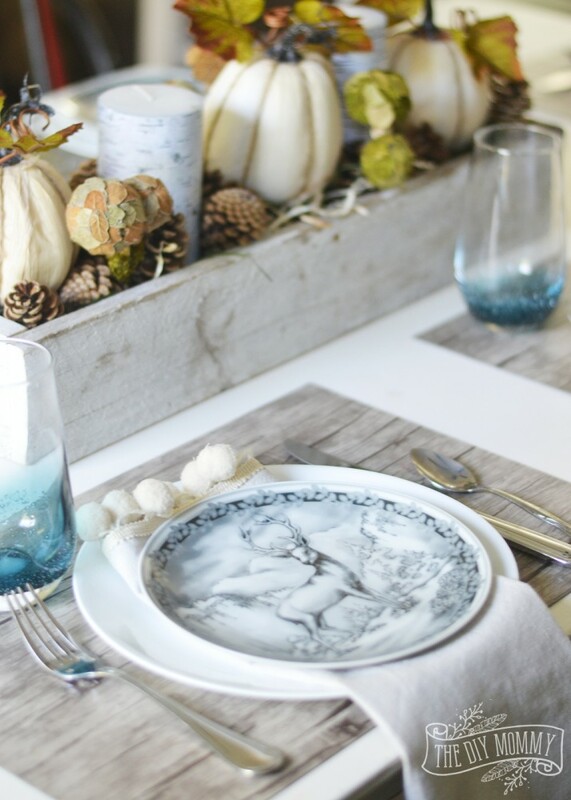 Looks great, love your fall table. The plates are adorable, and the napkins turned out so cute. As a Canadian blogger I especially look forward to these tours. Your home is lovely and beautifully decorated for Fall. 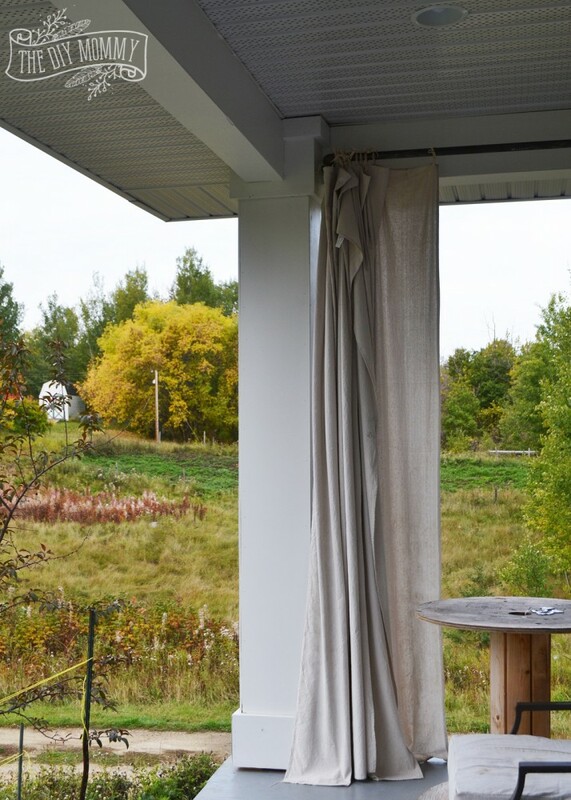 The outdoor views are spectacular and no wonder you fell in love with your new home. 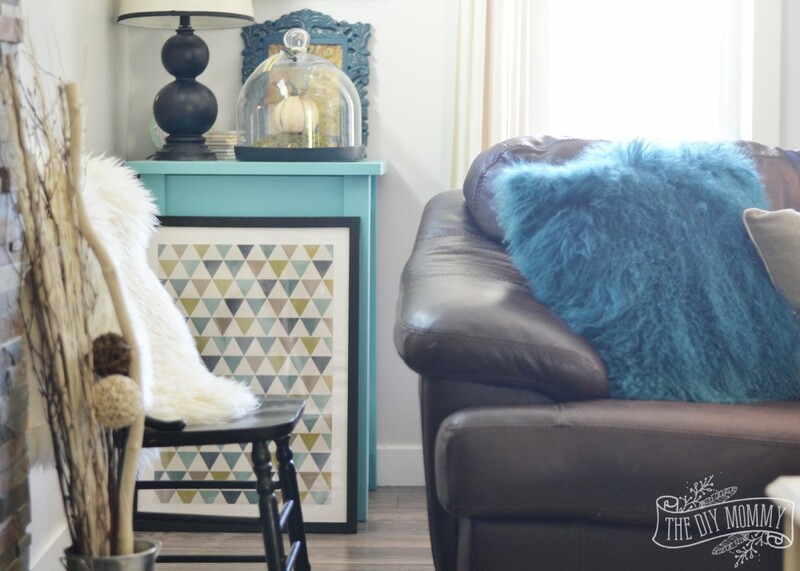 I am a fan of your colour scheme, I personally love to use neutrals with warm leather and pops of turquoise. 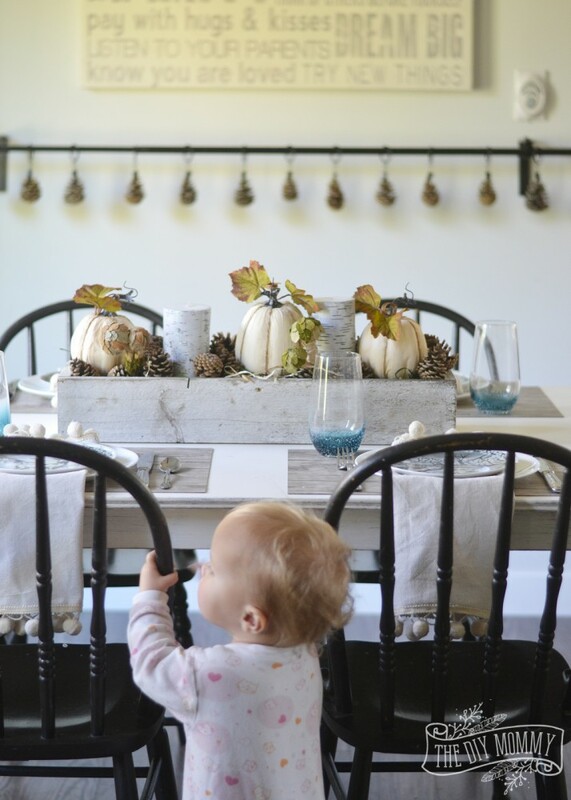 The tablescape is just perfect and so is the little one peering over the chair. Too cute! Thanks for the tour! Thanks for stopping by, Elizabeth! 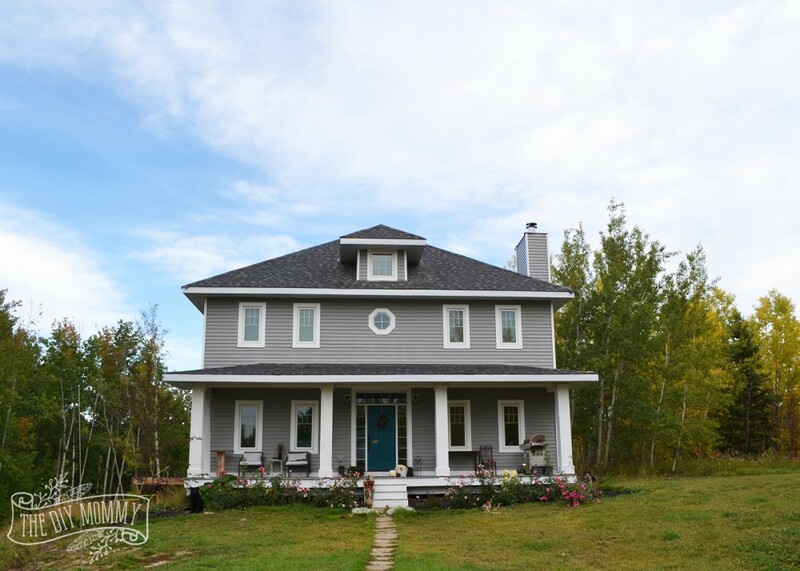 We sure do love our place and the beautiful Fall views – we try to spend as much time as possible outside when it’s so gorgeous like it is right now. 🙂 I need to head over to your blog to have a look! 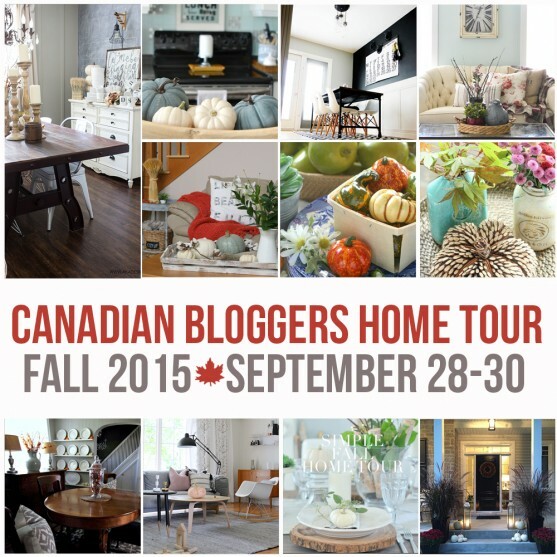 I knew this would be a stunning fall home tour! It is so bright and fresh feeling. 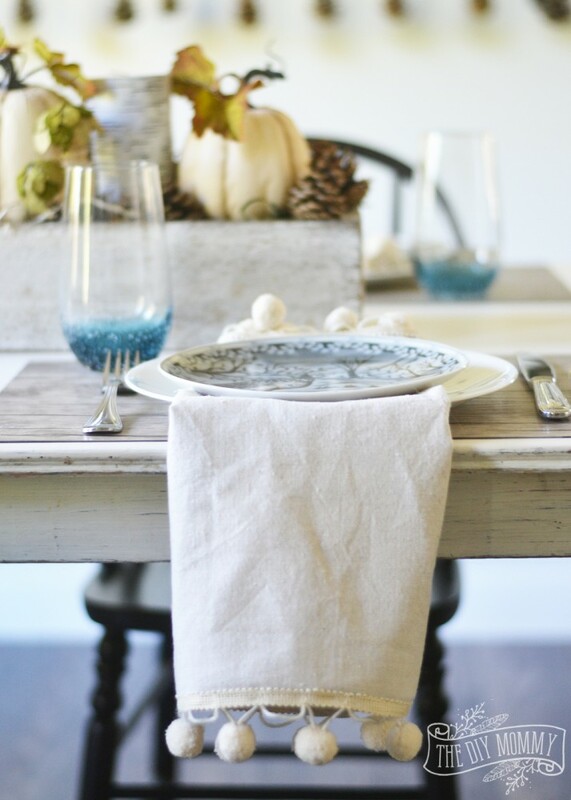 I adore your table setting, so rustic and pretty! Thank you, Emily! Thanks so much for taking a look! Your home is absolutely beautiful! The table setting is my favorite. Thanks for sharing your home. Thank you so much! 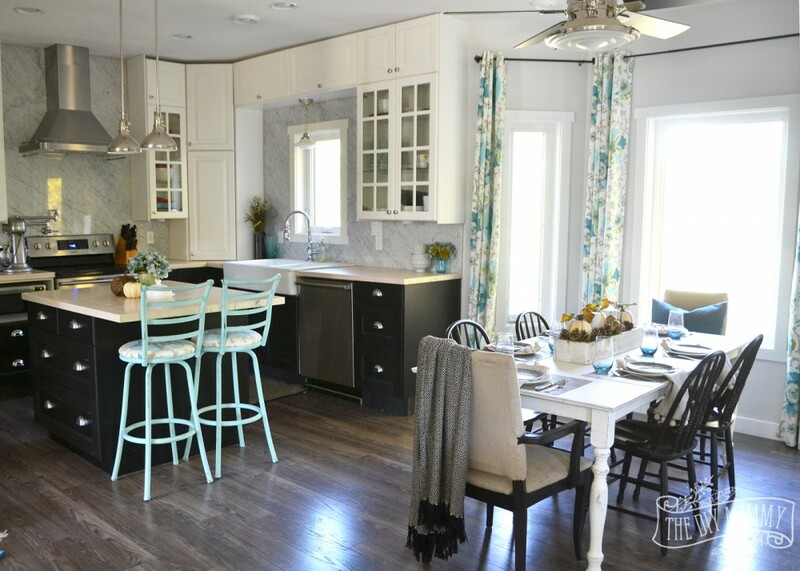 I love the setting too – the plates are so fun! Looks so great! Love your place settings! Thank you, Kerri! Thanks so much for joining the tour again this year. I loved your home so much! 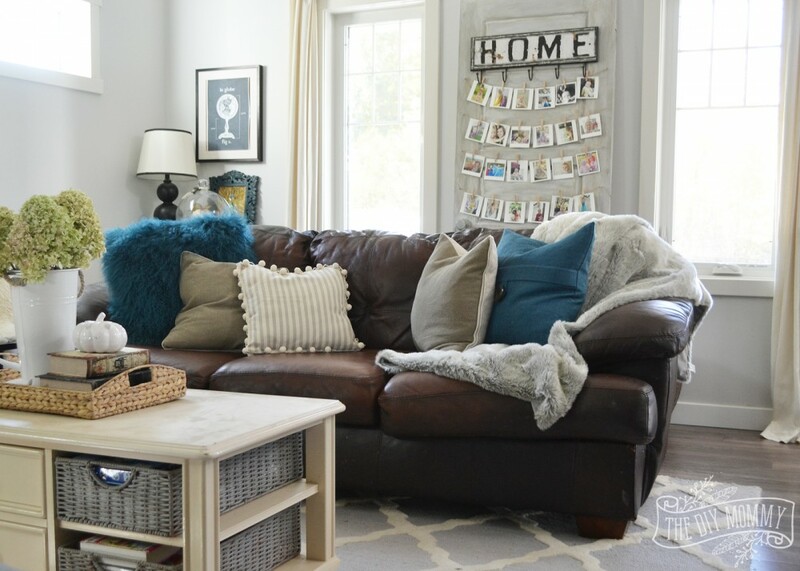 Oh my, your home looks so darn cozy! I love all your subtle fall decor, too! Thanks, Beth! Yes – I love that one too. She’s soooo sweet! Thanks, Ashlea! 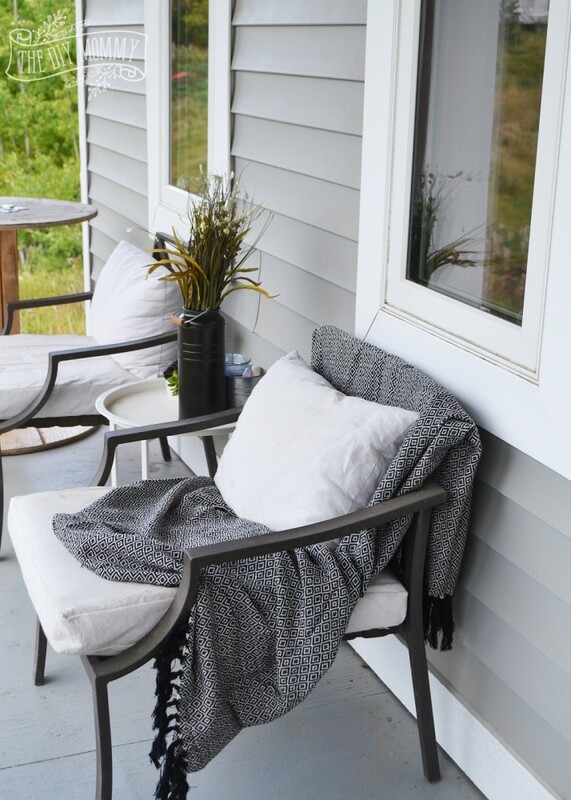 We sure love our porch – we spend so much time out there! Thank you, Angie! I’m so happy you were able to join in on the tour again this Fall. Thanks for sharing my tour, and I hope you have a lovely weekend. It’s just so pretty out there right now! Love the pom-pom napkin trim, your whole dining table set-up, the round mirror in front of the vintage window, and the faux antler! Yes, the caramel apple cameo was a last minute idea! I think it still looks great. Thanks again for giving it to me; it was soooooo good. What an incredible fall tour Christina! Your property looks absolutely amazing!!! 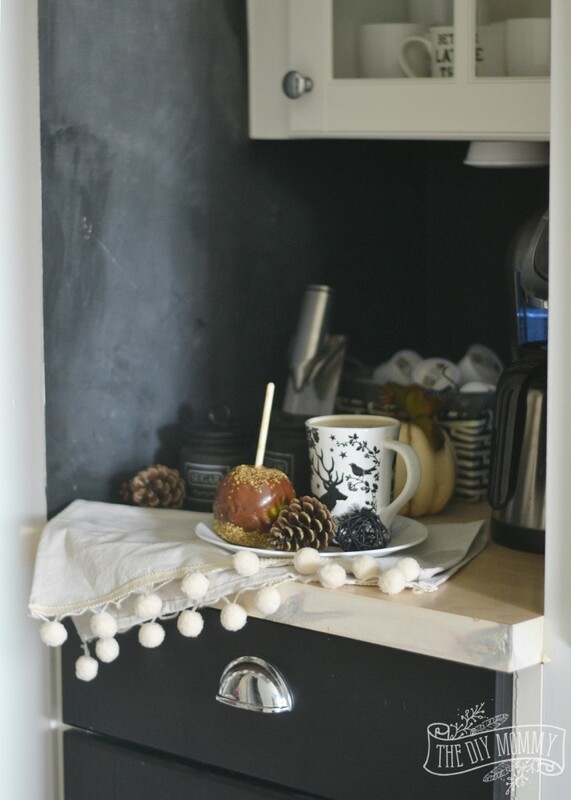 I really like that you styled your house simply but perfectly ready for fall:). Thanks, Tara! We love our little acreage. It’s hard to stay inside when it’s so gorgeous out in the Fall! So beautiful! 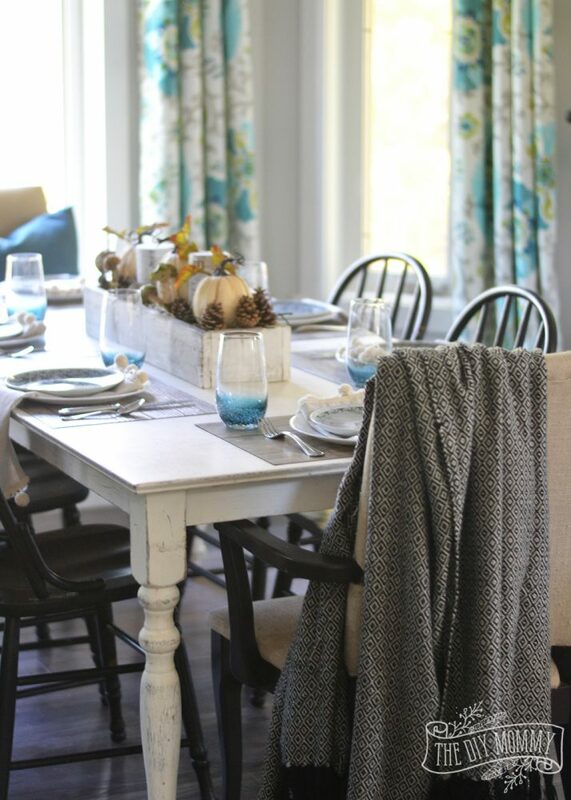 Love the table setting and those pom pom napkins are too cute! I love how you used clippings from your yard! 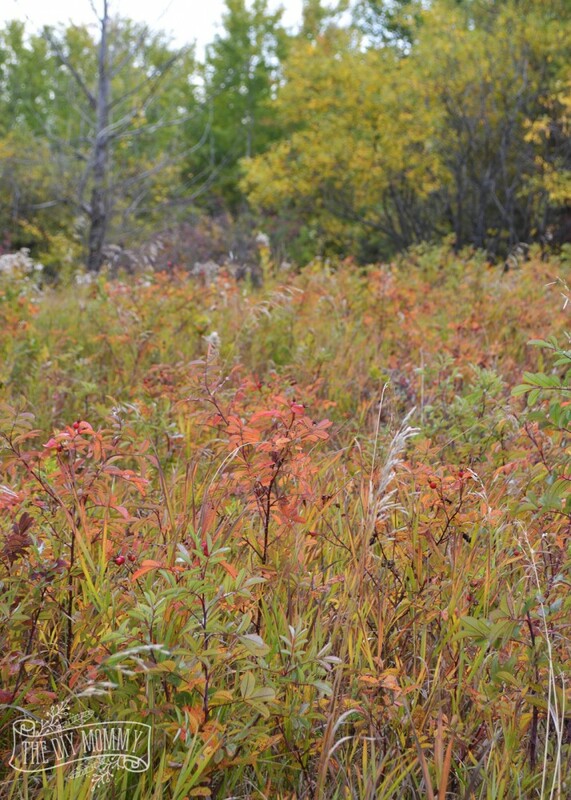 I wish we had leaves that colour but sadly everything is still pretty green here. Come ON, fall! 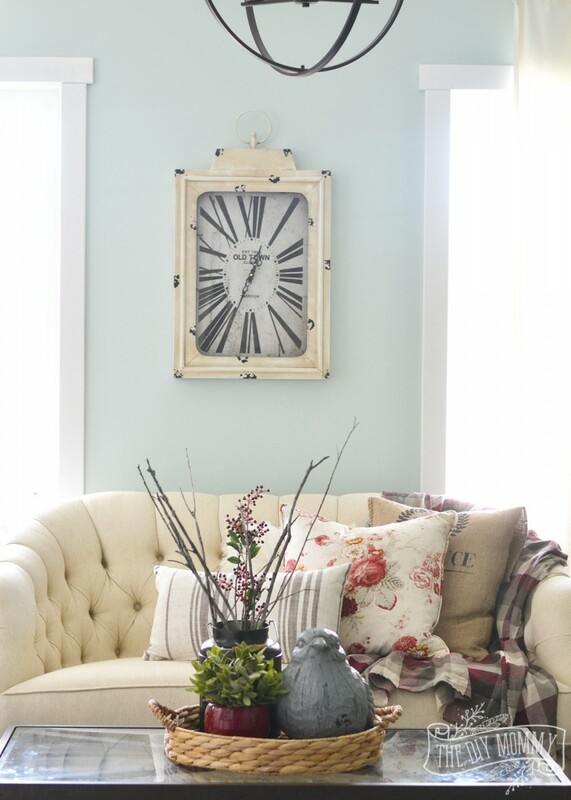 Courtenay @ The Creek Line House recently posted..The 5-Minute Decorator’s Fall Home Tour! I love your color scheme. So pretty and tasteful. Thanks for sharing. 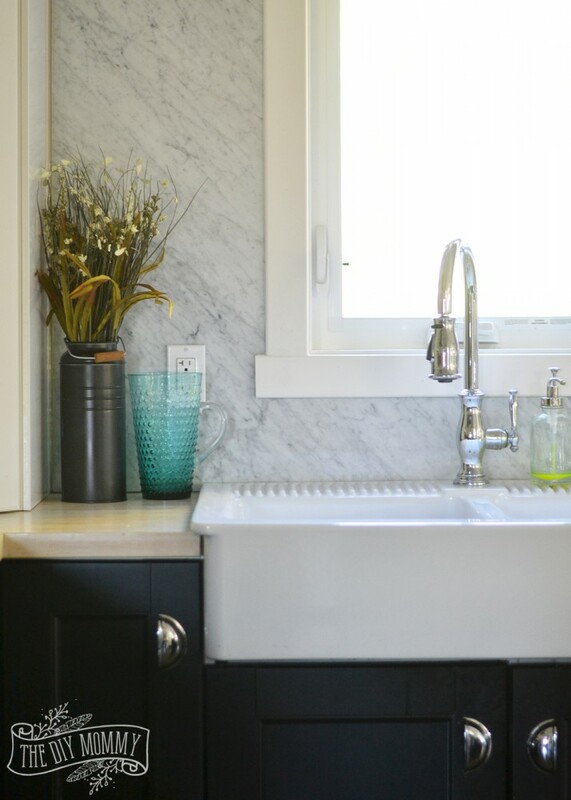 I am new to your website and love your beautiful house. 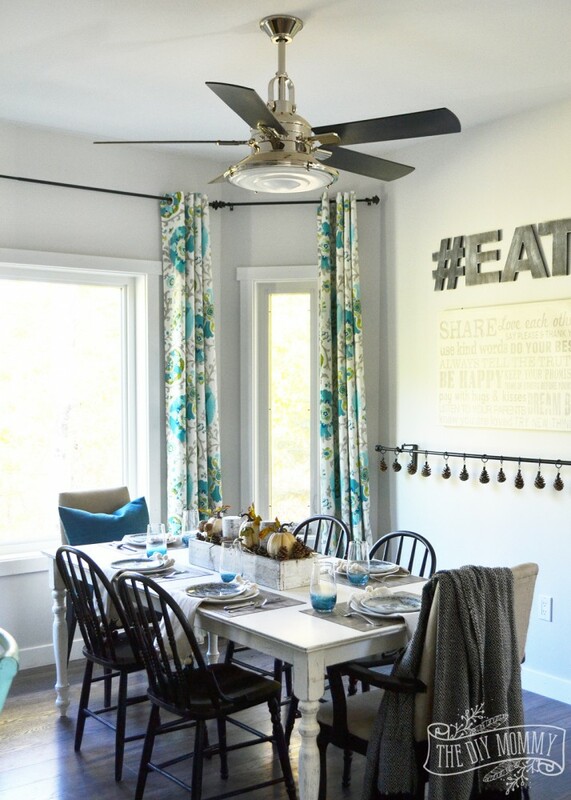 I am wondering if you can tell me where you purchased your dining room fan? Would love to have that for my kitchen!